Last year, we hosted my husband’s side for Easter Eve dinner. The celebration came to be because his parents had conflicting plans Easter night, when we usually gather for dinner, after a very filling brunch at my mom’s house. We’re both blessed and cursed to have both sides of our family live so close. Blessed to be able to see them whenever we please, but holidays often become a bit stressful. Rather than do what normal couples do and alternate each year, we attempt to do both. Splitting the Easter celebration between both Saturday and Sunday made it a dream. We had plenty of quality time with each side and didn’t feel rushed or overly stressed. So nice, that I proposed we do the same thing this year, what I hope becomes a family tradition. The second I came across the Kitchn’s Goat Cheese, Honey & Pistachio Mini Cheesecakes with Meyer Lemon Cream, I knew it would be the star of my Easter dessert. Weeks dwindled to days and I still wasn’t sure what I’d serve for dinner but this cheesecake was a certainty. I don’t own a mini cheesecake pan and given my kitchen storage situation, I had no intention of purchasing another accessory I would only use once in a blue moon. I was feeling brave. If 12 mini cheesecakes worked out so well, wouldn’t one giant one be even better? I was taking a huge risk. Forget the fact that you can’t exactly cut into a cake and test it before guests have arrived. 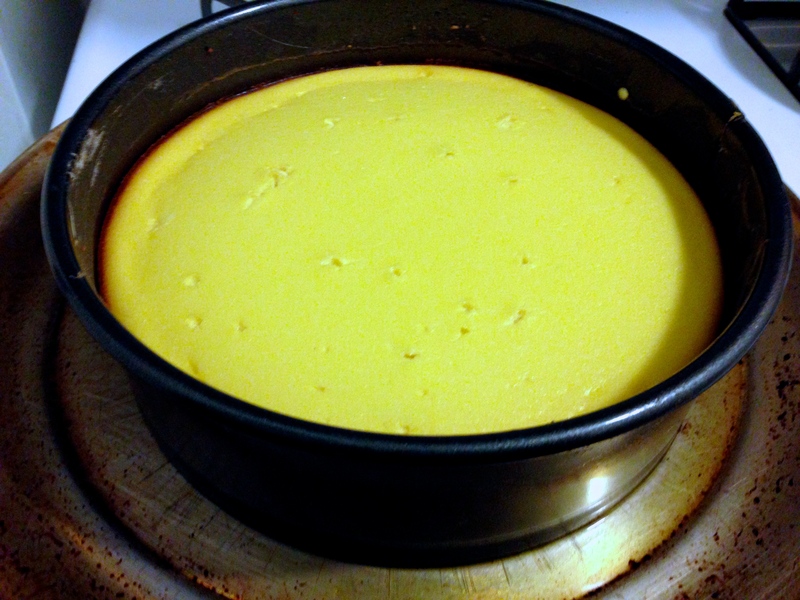 I was taking a bigger risk because, wait for it…I had never made a cheesecake before period. I’ve made ricotta cheesecakes, but never a regular cheesecake, with its crunchy, buttery graham cracker crust. Until about 6 months ago (read: Thanksgiving), I had never even made a tart crust before. There are plenty of things I can expertly bake. But those skills I haven’t developed…I stay clear of. I tweaked the ratios for the cake, crust and cream, varying each to what I thought would work with my 9-inch spring pan. The cheesecake turned out divine. It was rich, perfectly cooked and separated from its pan like a champ. The goat cheese added just a hint of tanginess and the lemon cream a bite of tart. The crust, on the other hand, had some challenges. I blame my less-than-flat beveled spring pan for this. It did its best to cling to the cake, but serving a perfect slice without a bit of crumble on each side proved to be impossible. Perhaps a flat-bottom pan or even some parchment paper would have helped? I’m open to suggestions! But even still, crumble and all, it was a damn fine first real cheesecake. For the pistachio crust, combine pistachios, sugar and salt in food processor or mini chopper and process until it becomes a fine meal. Transfer the mixture to a bowl and stir in the melted butter; the mixture should resemble wet sand. Generously butter and flour a 9-inch spring pan. 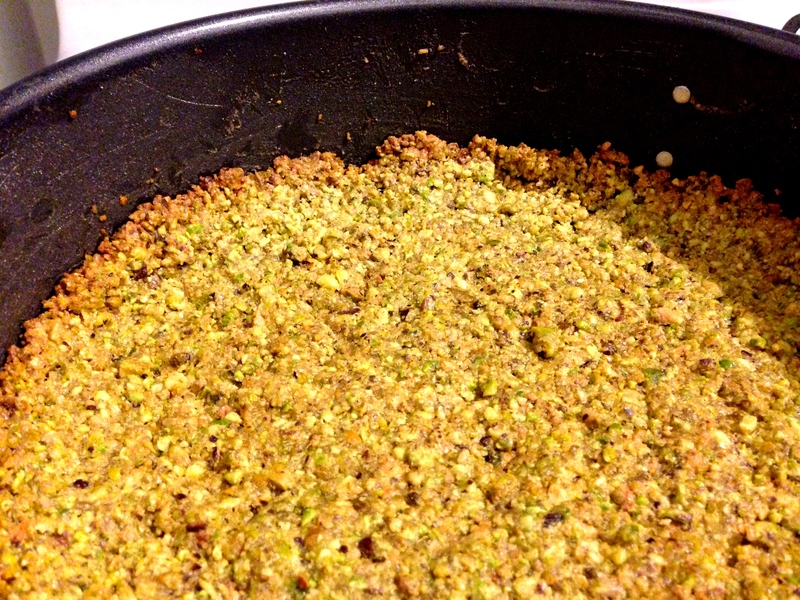 Press the pistachio crumbs into the bottom of spring pan and about 1-inch up the side. You want it to be about 1/4-inch thick. Preheat the oven to 400°F. While the oven is heating, refrigerate the crust until chilled. Bake the crusts for 12 to 15 minutes until set. Cool completely before filling. For the filling, lower oven temperature to 300°F. Combine the goat cheese and sugar in the bowl of a stand mixer and whip until creamy. Add the crème fraîche, honey, vanilla, and salt and continue mixing until smooth. Add the eggs, one at a time, mixing until just combined. Make sure to scrape down the sides and bottom as necessary. Pour mixture into the prepared spring pan. Place the spring pan on top of a rimmed baking sheet and bake 55-65 minutes, until the edge of the cake is golden and the center is just barely set. Remove from the oven and allow to cool to room temperature. Transfer the pan to the refrigerator and chill for a minimum of 4 hours. Transfer the mixture to a medium saucepan and cook over medium-low heat, whisking constantly, until the mixture reaches 165°F on an instant read thermometer; the mixture should be just thick enough to coat the back of the spoon. Transfer to another bowl and press plastic directly on the surface. Let cool at room temperature until ready to serve. For the candied pistachios, toss pistachios with salt and sugar in a medium bowl. Add water and stir with a rubber spatula until nuts are evenly wet. Spread nut mixture onto a parchment lined baking sheet and bake in a 350°F oven until golden and toasted, 8 to 10 minutes. Once cool, crumble the pistachios for serving. 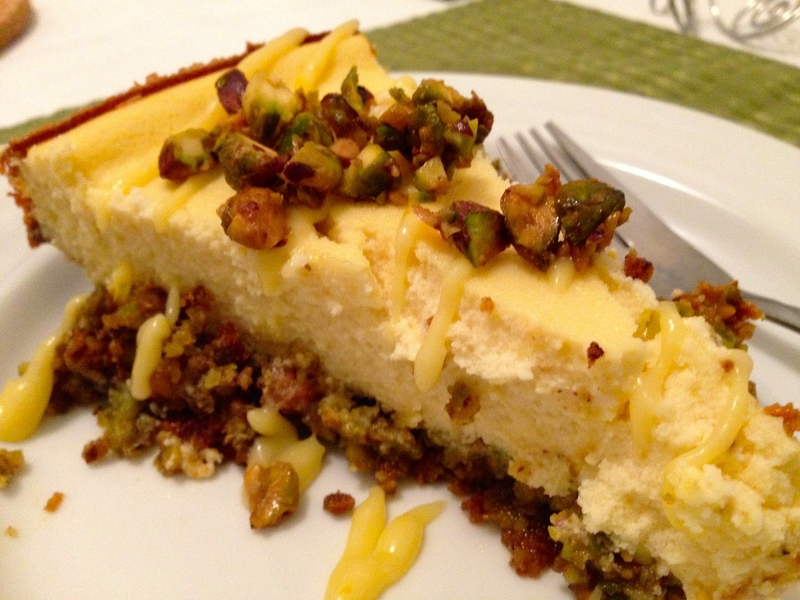 To assemble, slice cheesecake and divide among individual dishes. 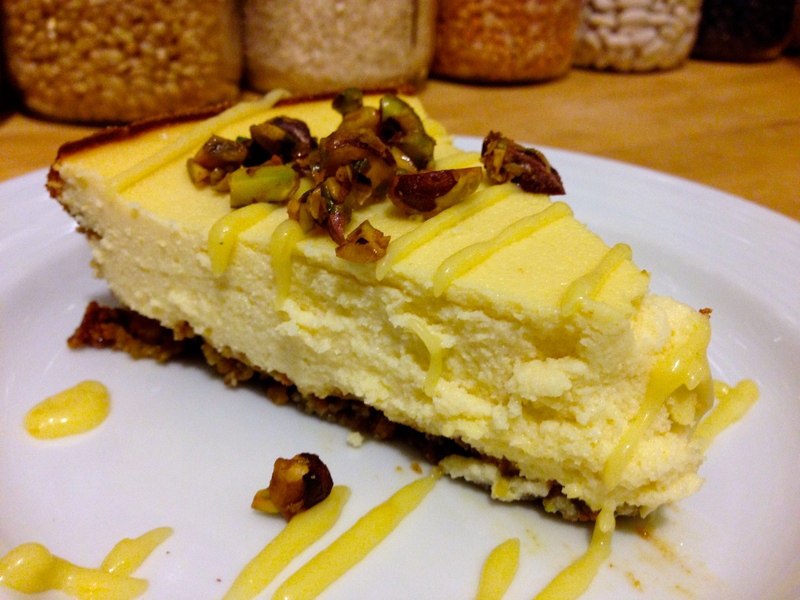 Drizzle each slice with Meyer lemon cream and sprinkle with candied pistachios. I can’t remember that last time I saw a dessert that had three of my favorite things in its name – cheesecake, pistachio and lemon. *Drool…. * Definitely saving this recipe. Thanks Nikki. It is absolutely worth every bit of guilt.